Sushi rice is the basic building block of many sushi variations. It is the hero ingredient of any sushi dish, and it will determine the quality of sushi you make. 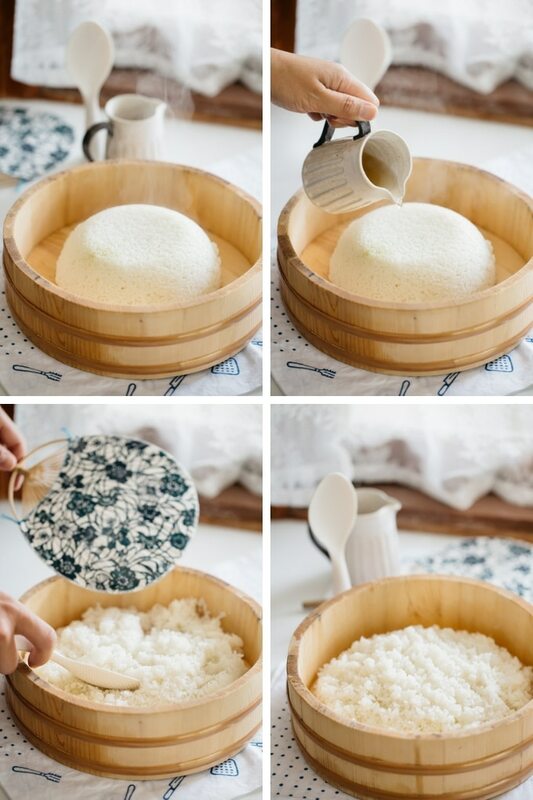 So I am going to share the authentic way to make Sushi rice perfectly. What is SUSHI by the way? Just in case you don’t know what sushi is, I am going to explain this. The first Sushi introduced was a method of preserving fish utilising rice fermentation. Japanese people started to eat the preserved fish with the rice after the Muromachi era. What we call Sushi is a bit different from its origin. So-called “寿司(sushi)”, the Chinese character was used as a phonetic equivalent in the Edo period. Furthermore, the word “SUSHI” is derived from Su-me-shi. The middle sound “me” was dropped later and became “su-shi”. Su means vinegar, (me)shi means rice. Therefore sushi is vinegar rice. Sushi is an essential part of Japanese cuisine and is probably the most famous and popular Japanese food. If you master how to make the perfect sushi rice, you can make any type of sushi successfully, such as Makizushi(rolled sushi), Chirashi-zushi(Scattered sushi), Oshi-zushi(pressed sushi), Temaki zushi(hand rolled sushi), Inari-zushi, Temari-zushi(sushi balls) sushi donuts etc. The main part of all these different types of sushi is obviously the rice. It’s vital that this is made well. So whatever type of sushi you choose to make will turn out super delicious! So to help you make sure that your sushi is always the most delicious it can be, I’m sharing with you a recipe for perfect sushi rice! Wooden tub – “Hangiri”, “Sushi-oke” or “Handai” are names for a Japanese wooden tub. It is a shallow and flat bottom wooden tub used to make sushi rice in Japan. You need to let it soak in water before use, so that it will not soak up vinegar for the rice and avoid the rice sticking to the tub. If you do not have access to this type of tub, you can substitute with a large mixing bowl. A Japanese fan – “Uchiwa” is the name of the Japanese fan. Of course it does not have to be this type. 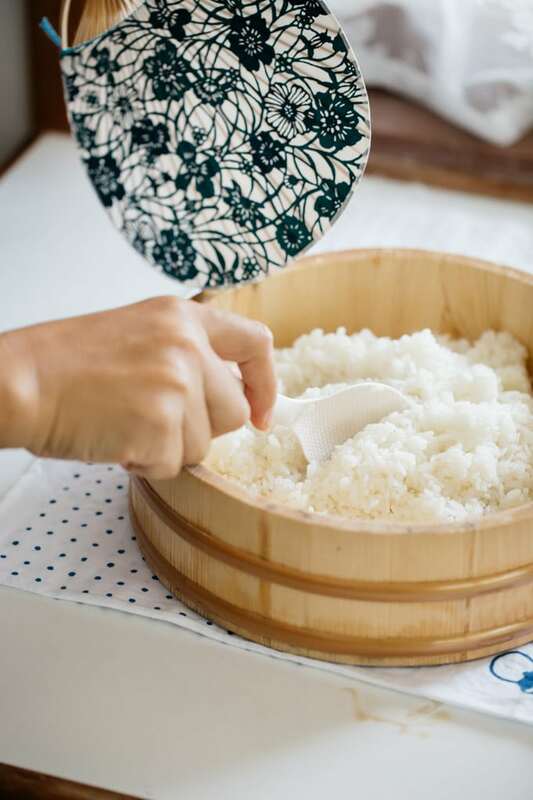 However, in order to make the rice shine, you need something to cool the rice down quickly while you are combining vinegar with the rice. Make sure the rice is hot when you pour the vinegar on top, so that the rice turns out nice and shiny. Don’t stir and squish the rice while mixing in the vinegar, you need to “cut” it into the rice. 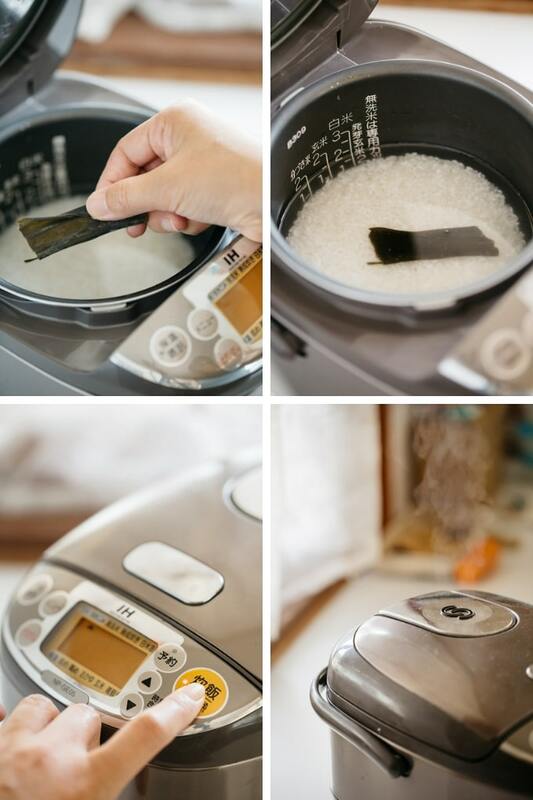 Use a fan to cool the rice as you “cut” the vinegar into it, so the rice is shiny. Hope this post helps you to make perfect sushi rice next time. Don’t forget to check out other recipes using sushi rice such as Salmon oshizushi, Temaki (hand roll) Sushi, Sushi in cups, Inari zushi, and Temari zushi as well as comprehensive Sushi Guide. 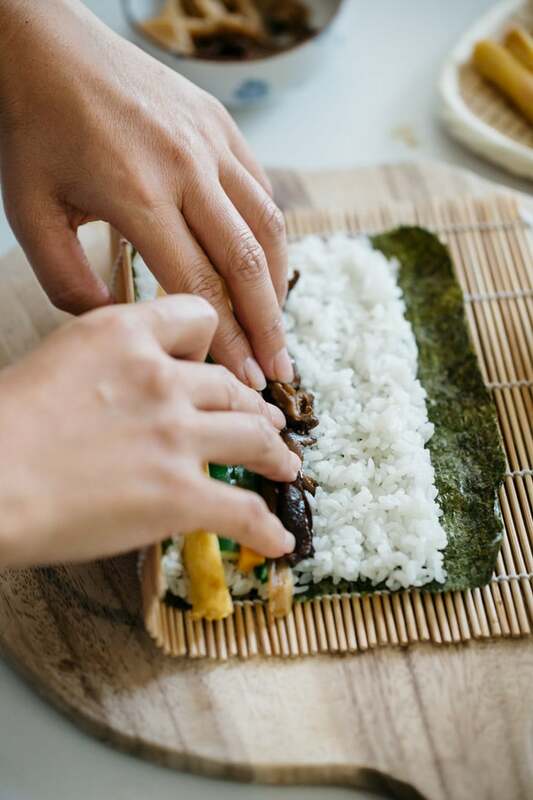 Sushi is an essential part of Japanese cuisine and rice is an essential part of sushi so it needs to be perfect so the whole meal tastes the best it can! Wash the rice a few times or until the washing water become clear. Drain the washing water and place the rice in a rice cooker. 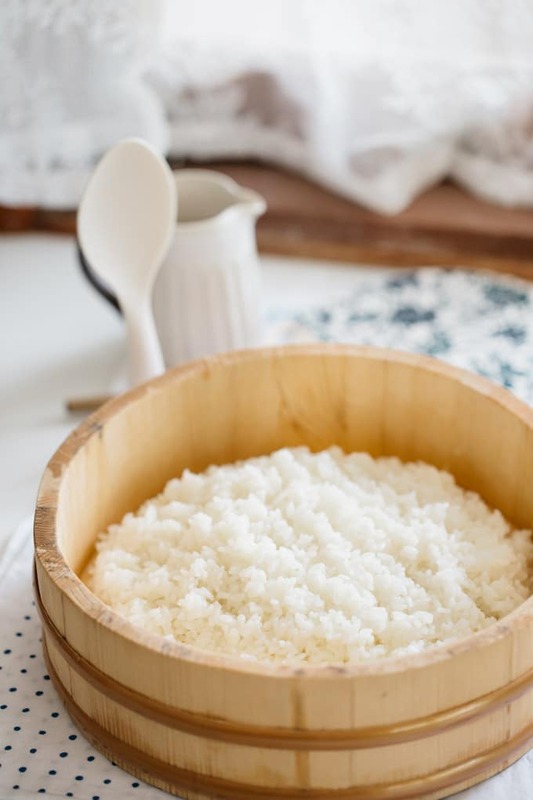 While the rice is cooking, in a small pot, heat the rice vinegar, sugar, and salt together to make the sushi vinegar on medium heat until the sugar dissolves. Moisten the wooden tub with water and wipe excess water off with a cloth. Once the rice is cooked, remove the kelp strip( if you used a kelp strip) from the rice and place the rice into the wooden tub. pour the sushi vinegar over it and mix to flavour the rice while fanning it to cool down the rice. While the rice is hot, pour the sushi vinegar mixture over the rice. Turn and mix to flavour the rice with rice spatula (called Shamoji) while fanning it to cool down the rice. While fanning with the Japanese fan(called Uchiwa) make sure that you are not mashing the rice, rather more like cutting motion. All the rice to cool at room temperature and place a moistened cloth over to avoid getting dry. *1 I used a Japanese cup. 2 cups in Japanese cup equals 300g. 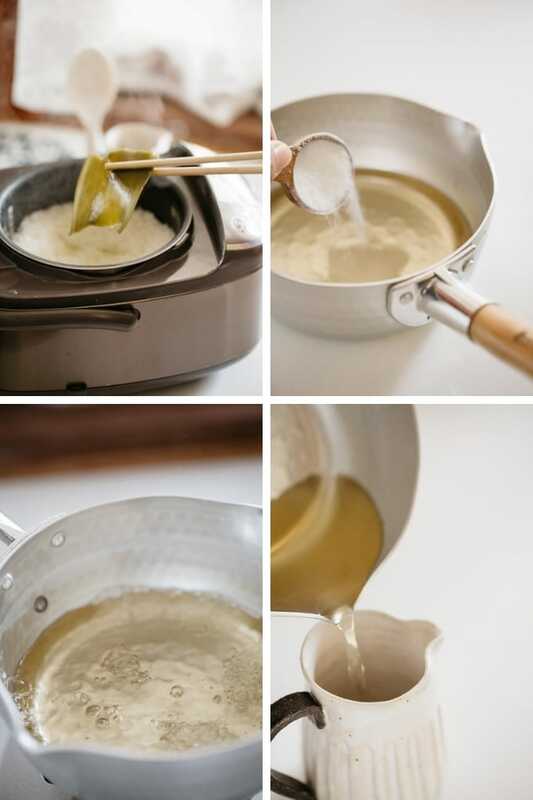 *2 You can either use a powdered dashi or kelp strip. *3 If you use kelp, just pop it in. If you use powder, just add to the rice cooker. *4 Nutrition fact is for entire rice. This amount of sushi rice will make 4 average maki zushi rolls. 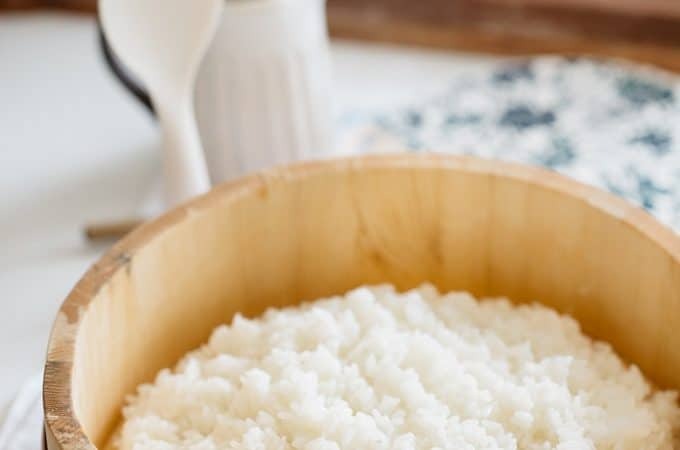 Rice vinegar is the best to use for making sushi rice. That is what authentic Japanese recipe would use. If you are unable to get rice vinegar, it can be replaced by white vinegar but the flavour will be slightly different. What brand of sushi vinegar do you usually use? Hello! 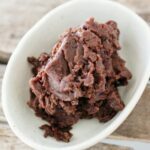 What brand of konbu dashi powder do you use? Is this something I can buy online? I live in the US, but don’t live near an Asian market. Thanks! Hi Dee, you can get Shimaya or Ajinomoto brand Konbu Dashi powder from Amazon 😀 They are about $8. this is what i needed for so long, thank you for sharing! 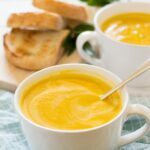 For one serving the calorie count is 1203 calories. This seems extremely high for a single serving. When I looked up a conversion chart for 300 grams of rice equals 1 and 1/2 cups of uncooked rice. When cooked this would be almost 3 cups of rice which is far more than one serving. I will reduce the amount of rice I use so that it will be much less in calories per serving. It does sound really delicious. I didn’t know kelp/dashi should also be added when we cook the sushi rice. Thank you for an informative post :)! I recently had lunch at a famous sushi restaurant in New York and they used some kind of red vinegar to season their sushi rice. The taste seems to be stronger than regular rice vinegar. I thought it was quite interesting but I guess it’s not very traditional right? Hi Sophie, no I don’t think it is traditional sushi. We always use rice vinegar, but hey adding some colour is quite creative 😀 . Such a wonderful and informative post! I do hope to be able to improve my Japanese cooking skills. Thank you Alexandra 😀 you have a wonderful weekend too! This will be super helpful in the future! I have a question though, if you don’t mind. 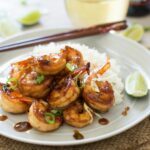 Can I use plain white rice without all the other ingredients and still make it sticky enough to mould? I’m very interested in learning how to make dishes with this (like onigiri) but I don’t have access to markets that would sell most of what I’d need, I don’t think. Thank you so much! Hi Ryoka, it depends on what types of plain white rice. For example, long grain plain white rice such as basamati rice are not suitable. It will be too dry. 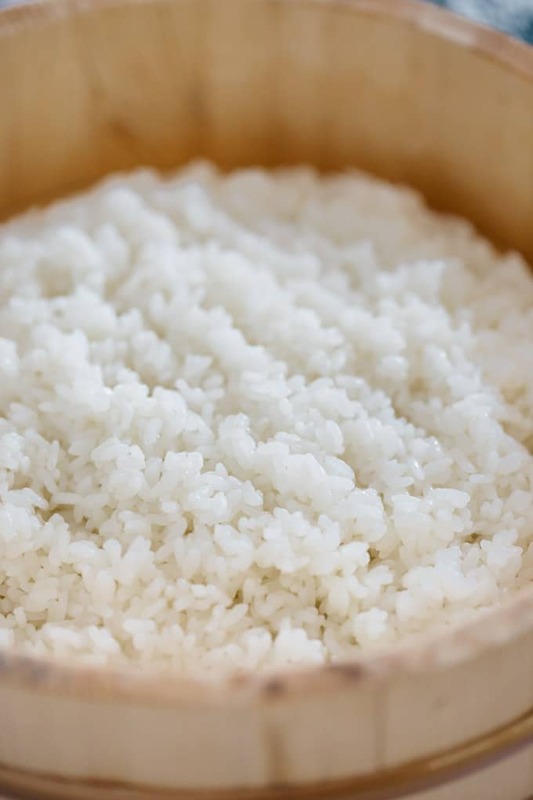 The rice Japanese use is Koshihikari and it is sticky enough to make onigiri without adding sweet vinegar. And Onigiri is usually made with plain rice, not with vinegared rice (su-shi). Hi Stephanie, That’s fantastic 😀 I am glad to know that your sushi making went well. Hi, i tried making sushi several times but i have two problems. 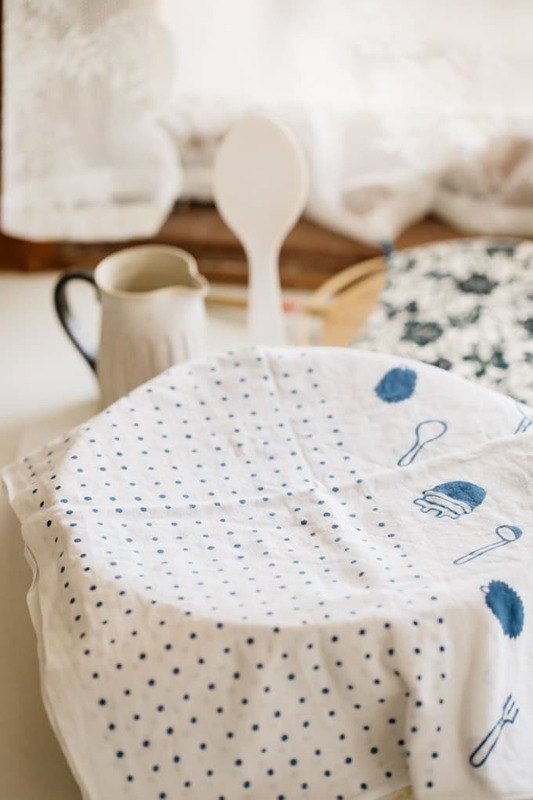 One is that when i cook sushi and put in the bowl ( i will buy hangiri soon) and when i pour vinegar and mix all up and put damp table cloth to cool …. the very moment when i take out nori and start spreading rice, it seems dry. I really have to stick it in to to fill the space at nori sheet. I dont know why is that the case, i bought proper sushi rice and it is moist enough after cooking. Second problem is getting the taste of vinegar but i think i will sort that out. Hi Alex, I am not sure, may be the rice type you use? and for the second problem the vinegar taste is subtle though usually. This is such an informative and easy to follow guide, thank you! My son loves sushi. Now I know exactly how to make the rice for it. Thanks! Thank you for such a great tutorial!!! I always seem to mess up sushi rice, but with this method it was perfect. My kids LOVED having sushi rolls for dinner. You are welcome Claire 😀 Thank you for the comment and great rating. I SOOOO needed this. I always mess up my sushi rice. Too sticky, not sticky enough. These tips worked wonders. THANKS! I had no idea sushi rice had to have vinegar! No wonder mine never turns out! Can’t wait to try again with your method. 2 nitpicks: some rice vinegar, like Marukan, already has sugar and salt, so you’ll want to skip adding those again. Also it wasn’t quite clear if the volume of the rice vinegar is given in US cup or JP cup (since below JP cup was referenced for the rice).